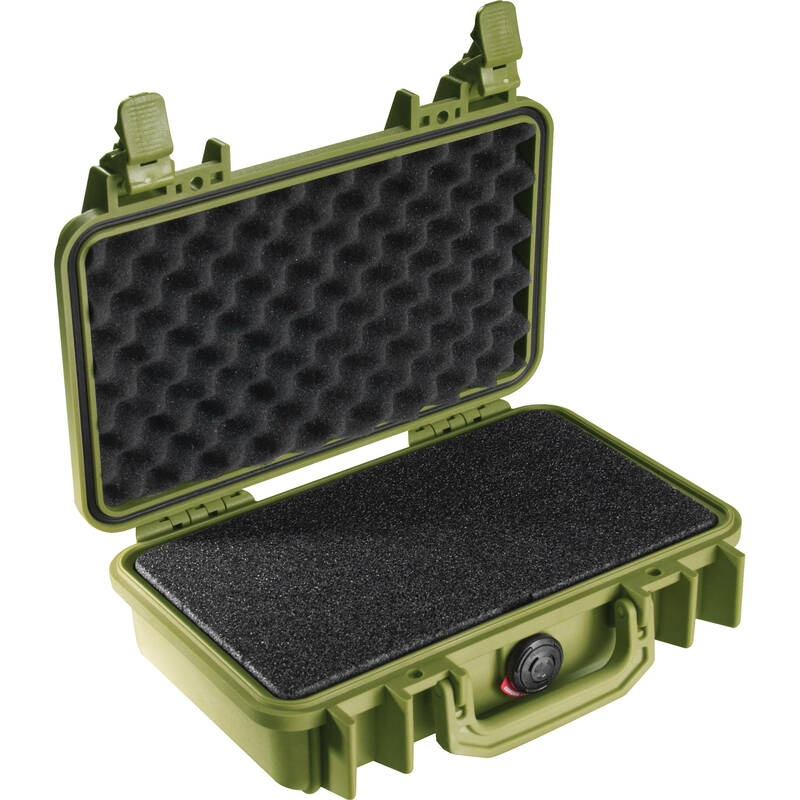 The Pelican 1170 Case with Foam (Olive Drab Green) is designed to carry a portable electronic device that requires protection form shock. It is a watertight, crushproof, and dust proof ultra-high impact copolymer case with a strong and lightweight open cell core with solid wall design. The interior has 1 base layer, a Pick N Pluck foam layer and a convoluted foam lid. It has easy open double throw latches, an automatic pressure equalization valve, an o-ring seal and stainless steel hardware. The case is carried by an oversized folding handle. Box Dimensions (LxWxH) 12.1 x 8.8 x 4.1"
1170 Case with Foam (Olive Drab Green) is rated 4.9 out of 5 by 96. Rated 5 out of 5 by vlad from Great for DJing! I keep my external hard drive in it along with tonearms for my turntables and the headshells + carts. it offers excellent protection against rough handling and fits my items very nicely! the pick n pluck foam was insanely easy to shape. when I need to, I can also throw my serato interface in here and carry it with me without fear of it getting banged up in my bag. definitely recommend. a lock is nice if you're working shady gigs, you can leave your wallet or other valuables in it if you need to take them out of your pocket and don't want to leave them on your table. Rated 5 out of 5 by Daniel S. from Solid - Indestructible Another Great Pelican Case!This one is used for wireless components.Have over a dozen Pelican cases of all different sizes. Some are approaching thirty years old. All of my Pelican cases can take the beating they get in the back of my old FJ40 bouncing around the desert. Gear is protected from the dust that we have here in the desert.No problems with these cases getting damaged other than a scratch here and there. I don't worry that I will have what happened to an old Haliburton case that I bought back in the 70's. It now has a bondo patch where it had a hole punched in it when an ammo can went airborne and landed on it while running down a rough forest road. Rated 5 out of 5 by warcraftjs from Works for what I needed it for. I bought this for when I travel with my pistol, mags and ammo. The Pelican 1170 fit my Glock 19, 1 mag, and 1 box of Critical Defense in the Case. I'm positive I could have fit one more Mag in the case but I really didn't need it. The Pick out foam is great. Tho I did put a layer of foam under the firearm so it sat closer to the top layer of foam so it didn't rattle around in the case. Would not have a problem buying again. Rated 5 out of 5 by G22Shooter from Better than it has to be The Pelican 1170 isn't just good - it's better than it has to be. Value is quality/cost and this case is a real winner when it comes to value. I purchased this case specifically for complying with airline and TSA requirements for Traveling with Special Items (@). This case is incredibly tough, sturdy, structurally sound and I have complete faith that it will protect my special items while flying. One particular noteworthy item about this case is that the padlock holes are not at the outside corners of the case, like with so many other cases. Instead the padlock holes are between the latches and the handle and are protected in a way that would make it very nearly impossible to use bolt cutters to cut the case to get at the contents. For the cost, I think I will order another one so I can have each of my special items traveling with me in my checked luggage. Rated 5 out of 5 by Anonymous from Fits like a glove... I'm a documentary filmmaker who does a lot of traveling and I appreciate the security of my footage above all else. My primary backup drive is a 4tb G-raid (one of the newer ones that is the same size as the 2tb older model). I was pleased to find that my drive fits perfectly in this case. Fantastic! The only words of wisdom I can offer is that you should perhaps put one or two of those moisture absorbing silica packets from beef jerky in there to absorb any extra humidity and make your drive smell like beef jerky. Rated 5 out of 5 by a3ng25 from Awesome I use the case to hold my glock 19. The case seems very sturdy, feels strong in your hands but still isn't super heavy. The dimensions are enough to hold the gun with a magazine in and two magazines laid along the sides (perfect size). I'm confident that my gun is secure and safe inside the case and I could lock it with a pad lock if I wanted. Rated 5 out of 5 by michael b. from Pelican 1170 Perfect Fit 7 inch Monitor Case. Rugged design, multiple layout options. Rated 5 out of 5 by DLombardi from Amazing Value It's hard to find anything new to say about a Pelican case as a compliment. If you haven't used one before, you don't know what you're missing. Obviously these aren't discrete, modest cases. These are, first and foremost, for protecting what's inside. Any Pelican case does a great job at protection, but this particular case has the benefit of an amazing price point to boot... under $40. It's hard to find a portable phone case that's much cheaper then this, let alone something of this complexity. Solid, well made, and affordable. You just can't beat it. Will the ATN X-SIGHT II HD 5-20x fit better in the 1170 or the 1200? This scope will not fit in the 1170 case! can this hold these lenses: 20mm + 50mm + 18-50mm ?? Nope. Buy larger case with higher height. does this case have places for padlocks ? Yes it has a place for 2 padlocks. You'll want to get a short hasp lock. Because you could potentially open the case enough even when its locked to get some of the contents out. The pelican lock listed in the accessories is too loose and can fit a handgun through the gap that it creates even if it is still locked. What size is this case?